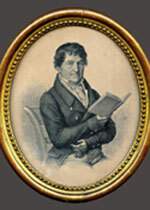 Ernst Wilhelm Martius was a university pharmacist in Erlangen and co-founder of Regensburger Botanische Gesellschaft (Regensburg Botanical Society) when he was asked to teach lectures on pharmacy and pharmaceutical trade at FAU in 1818. Martius quickly discovered that the training students were being given was only distantly linked to the practical work of a pharmacist, and that the University was missing artefacts which could be used for the purpose of illustration during classes. This was how he came to establish a collection of raw materials from across the globe. These materials were all used as basic ingredients for medication, food and other important commodities. By setting up this collection, the pharmacist wanted to ensure that, in addition to learning the descriptions and effects of medications, his students would also be taught about the origins of these substances. During his time as a lecturer between 1818 and 1824, Ernst Wilhelm Martius laid the foundations for specialist training for pharmacists. This was also the beginning of pharmaceutical training at FAU.